If you have ever visited Kuala Lumpur, Malaysia, then you would know that one of the most visited shopping malls there is none other than Berjaya Times Square. This huge complex is divided into three main sections. They are the east, west and central wings. The centre portion of the mall is known as the Lower Ground Concourse and it is located on the lower ground floor of the central wing. Previously, when visitors wanted to get to the lower ground floor from the ground floor of the central wing, they had to make their way over to either the east or wing to take an escalator down. Over the years, the human traffic in the mall has increased steeply and Berjaya Times Square realises this. This is the reason why they decided to build their first ever Grand Musical Staircase. It was only recently that the Grand Musical Staircase was revealed. In fact, the staircase is vibrantly lit in dancing LED sound graphs and designed to resemble a classical piano keyboard down to its actual chords. Aside from that, this piano does not merely showcase its normal piano sound. It is also capable of emitting sounds of a harp, percussion and flute. The bottom part of the staircase on the Lower Ground Concourse is installed with liquid panels that will produce ripples with each footstep. At the same time, it is being covered with fibre optic lights and zen-like steps which will greet visitors at the Lower Ground Floor. The whole concept of the staircase is to provide shoppers an illusion of walking on a sea of stars. The goal of the mall management is to promote a healthy lifestyle by getting shoppers to take the stairs. They hope that by adding an element of ‘fun’ into one’s normal routine, it will be enough to convince shoppers of taking the stairs. The management are quite convinced that the younger ones will be more inclined to taking the stairs when they realise that there is a giant piano staircase in the mall. 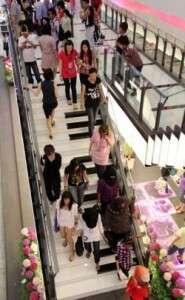 In all, this Grand Musical Staircase took a little more than 13 weeks to be completed with a cost of RM1.5mil. If you would like to read more of the full story, you can do so here. At Awesome Piano, we provide only certified piano teachers in Singapore. We have a pool of teachers available to meet your needs, so check our website for more information.